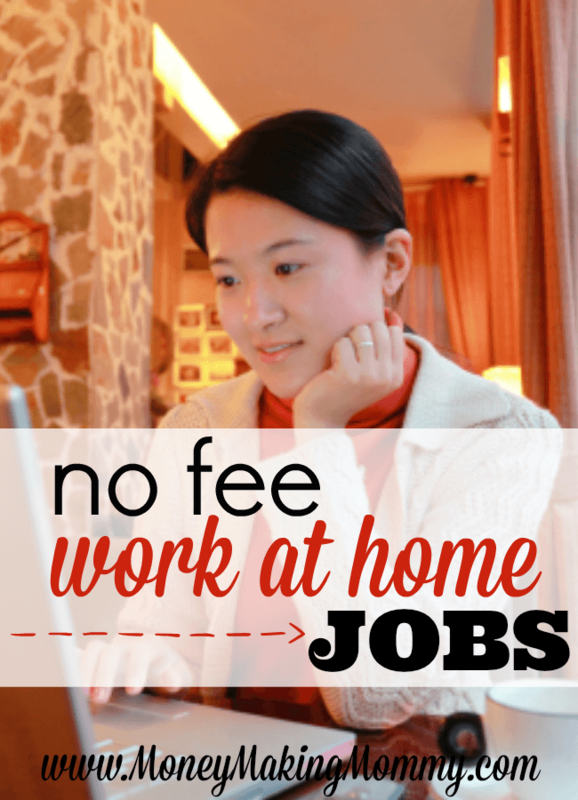 No fee work at home jobs are everywhere online (I promise!). Toss that newspaper and forget the “We're Hiring” signs in front of businesses and retailers. Rather than wait around for that amazing job to fall in your lap – let's explore some options! Trying to find no fee work at home jobs can always seem like an obstacle course. Avoiding scams and not paying anything, it seems like all you find are one or the other. Online jobs or working at home is a dream many of us hope to make come true. Because earning a supplemental income or second income while staying at home to be with your children is a career worth seeking. I understand all too well what it's like to look for work at home or desire your own home business. I've traveled the same path you are on now. But when I did it, there were fewer resources and fewer scams as well. So do keep your eye out for opportunities that ask for your bank account information or anything weird. Over the years though, I HAVE filled out many W9's and given direct deposit info. BUT the job was well vetted and all was kosher before I did that. Typically work at home jobs aren't going to ask for a payment of any kind. Now home business opps and money making info (see money making program reviews here), that's different, they are selling you a product or kit. On this page are actual jobs I have found on the internet through various research. And though this page is no longer updated on a regular basis because I now have my Work at Home Job Board, there are still great opps to peruse. If you find a link that doesn't connect any longer or a job that's been filled, please kindly let me know using the contact form. (Please include the actual job post or at least the position when you email me – that would help – thanks!) I appreciate your help and it only makes this resource for home employment better for everyone. Most of all, I really do want you to find a job, that's why I created MoneyMakingMommy. At times it can seem like it's just not even worth the effort of looking anymore. Just keep notes on jobs you think you're qualified for, along with links that you found helpful. Also search terms and anything else that you're using in your job search. Keep it all in one place and that way you'll have some recollection of what you've seen and what you've found interesting. what you've applied for. Try to keep notes on what cover letters have received a response, what changes to your resume you've made that helped, didn't help. It's important to take it seriously – but don't let your search consume you. Just keep at it. There are no fee work at home jobs for those that are persistent. And a lot of times when you aren't really looking, you come across an awesome site with great info or it has great resources. You might even find sites that post job leads like I do here. New sites go up every day – and though MoneyMakingMommy has been around since 1999 – there are up and coming sites that might have something worthwhile to offer. Just be careful of super new sites – let them get some time under their belts and make sure they are not “fly by night” operations. And remember — when you subscribe to my updates, you not only get free, current job leads — you'll also get access to my list of over 70 job search sites! Obviously for me to try and verify every single job it would be an all day and all night project for one person. I have a family as well… So there is simply no way for me to verify every job that gets posted. These jobs do appear to be legit and if any of them turn out to be a known scam, I remove them from the no fee work at home jobs section. You know in your heart what type of job you're looking for. I don't. You know when something sounds like a scam, I think we all do. So be careful. Of course, some of us will pay for information on making money (see earn online section here), or to join a home business. I decided to sell Avon. For my kit, I paid $10 a few years ago. I am getting something for my money – the tools to start my Avon business. Just because it wasn't “no fee” doesn't mean it's an outright scam. I think that word is used too often and as a blanket term. Some people just don't want to get off their butts and work – so they sign up for something, do nothing and then yell “scam”. Finally, the jobs from home list below are assumed no fee. Bookmark this page to get to it quickly later. I'm always seeing jobs available in customer service. Many of them will train you and don't require prior experience. If you're super worried, read my post, 20 Entry Level Work at Home Jobs to Make Money. There might be a company or two below that require a background check. Currently hiring virtual agents and customer support reps. Average pay is $15 an hour and you pick your own schedule. Remote Concierge Agents are local experts that assist clients with requests for information, such as travel and destination information, or assistance with everyday tasks such as restaurant recommendations, ticket purchases, or finding a quality house cleaning service. This position is ideal for individuals seeking to work from home such as stay-at-home parents, retirees, graduate students, disabled people, or any skilled professional looking to earn significant income while working from home. This company hires teleworkers from everywhere to do data entry, clerical, order processing and customer service. Position Type is Contract. Either Full Time or Part Time. We are looking for flexible, PC-savvy individuals to work on a part time basis and who live in the following states; Delaware, Illinois ,Montana, New Hampshire New Mexico, New York, Ohio, Oklahoma, and Oregon. Successful candidates must have their own PC with reliable high-speed internet connection, a dedicated land line telephone (conventional non-wireless telephone connection) for incoming calls and can type 35 words per minute. Prior call center experience preferred. Applicants must be 18 or older and have a high school diploma or GED to apply. Good typing, writing, spelling and math skills, with strong communication skills required. Seems like they hire a lot around Mother's Day. SYKES Home offers exciting careers helping others through customer service. Join the team of 6,000 agents across North America who accept inbound calls routed virtually to their homes, supported by our team of leaders dedicated to helping you succeed and grow in a fulfilling career. Paid training and benefits. Get an idea of what you'd be doing working for Sykes in customer support and the requirements by watching the video below. First of all, our pool of resources stretches across the country, and because of our emphasis on working as an independent contractor, we are able to solidify relationships with such qualified candidates as college-educated work-at-home parents, the disabled, and many other intelligent, hard-working individuals from all walks of life who have one thing in common: the desire to work well, and work from home. This is one of those skills that I wish I had. There are some very well paying jobs in transcription and I personally know two people in my town that do medical transcription from home. I have a bigger list of this type of work that you can read if you like, Online Transcription Jobs That You Can Do From Home. As a result of more clients, we're hiring data entry operators, translators, transcriptionists and customer support positions. Company is based in South Carolina. Contracts typists and word processors throughout the United States and in addition, Canada. They occasionally put holds on the application process if they get flooded with apps. So you will need to simply check back with them. Do not send your resume if there is a hold – it will not be received. Location of position is in the United States and is open nationwide. In addition, you will need 4 years of transcriptionist experience. NJPR, A Growing NJ based company, is seeking Medical Transcriptionists with 3+ years experience for transcription of Hospital Medical Records including history and physicals, consults, operative reports, discharge summaries and psychiatric reports. Knowledge of AAMT guidelines. Work at home as independent contractor or in office as employee. Experience needed for this position is 2 years as a transcriptionist. Transcribers are hired for the entertainment industry. You do need to have a foot pedal. Created by Janet Shaughnessy, a mom that works full time at home as a transcriptionist. Knowing more than one language is always a bonus when job hunting – no matter what type of job. If you're looking for work at home, there are many openings in translation. There are several listed below, but also see my list here, Freelance Translation Jobs – List of Companies. ABGlobal Translations is the on-line service of Pegasus Translations, a Washington, D.C., company that was founded in 1979 to provide high-quality translation services to the government and the private sector. Since then we have served hundreds of clients, from large government agencies and law firms to non-profit organizations and private individuals. We are a family owned and operated business. Because we are one of the oldest businesses in our field, we know what excellent work and old-fashioned personal service are. We're offering you both. No phone menus, no answering service, no bureaucracy. Applicants must have minimum 3 years' translation experience, good communication and organizational skills, advanced level in Office (MS Word, PowerPoint, Excel) and have fast internet access. Knowledge in CAT tools such as TRADOS is an asset. Looking for translators and proofreaders. Other positions available as well and this includes voice over work. NetworkOmni® welcomes the opportunity to work with highly experienced freelance translators and interpreters on an independent contractor basis. Successful candidates must have a minimum of 3 years professional experience in translation or interpretation, a higher education degree and an established record of performance in various subject areas. We receive a large volume of resumes daily, so therefore we are unable to reply individually to all resume submissions. Those candidates, however, who meet the minimum requirements stated above will be evaluated and processed through our extensive screening procedure. Successful applicants will be invited to join our professional team on a formal contract basis. GoFluent is hiring 50 people to work at home. Hiring freelance translators in addition to intrepeters. Being an online tutor or teacher is still something I consider all the time. I think it would be a fulfilling job in many ways. Helping someone learn and having control over my own schedule seems win-win. You can see a bigger list here, Online Tutoring Jobs – Work From Home. Telecommute so that you can work from home doing something you love. Hiring tutors to help students from around the world with English, Math and science. Looking for tutors to teach English to Chinese children. Flexible hours and good pay. This content is exclusive to MoneyMakingMommy.com – if you see it on another site, it's been stolen or copied without permission. Earn extra money by working as an online tutor from home. A leading academic tutoring company is launching its Internet division and is actively recruiting part-time and full-time tutors to teach math (basic through calculus), basic science, biology, chemistry, physics, and English. Work from home and tutor students from around the country through the Internet. Tutors and students speak to one another through audio technology, write diagrams and equations using a shared multimedia blackboard, and type messages to one another through instant chat. Our system is user-friendly, and we provide you with all the online training you need. Flexible work schedule. Become an online tutor or teach another language online. Chose when you want to work and what your rates will be. You'll be working with students around the world. Everything can be done online – no need for travel. You keep all your earnings – there is no fee or monthly membership dues. Payments are made via PayPal. Greeting card company that focuses on pets – occasionally hires verse writers and sometimes photographers. *See more no fee work at home jobs for greeting card companies here. Seeks qualified freelance writers, editors, copyeditors, and proofreaders. You must be completely equipped for handling work through the Internet. We are only interested in professional, highly skilled writers and editors with at least three years of practical experience. First of all, our company provides writing (among other things) to a host of clients world-wide and are in need of qualified freelance writers. Pay varies depending on the client, content, length, etc. Please check out our site for more details. We look forward to working with you. We are currently looking for published Spanish freelance writers. Interested parties must be able to present proof of published clips or verifiable writing credentials. You must also be proficient in the English language in order to communicate clearly with some of our support staff if necessary. Interested parties, please send us a cover letter with a brief outline of your experience. Please DO NOT send your clipping or resume' at this time. We will be able to judge your writing ability by the strength of your letter; however, be prepared to send us a resume' and clippings upon request. Perform quality assurance editing and proofing. Monitor and quality check your assigned workflow production. QA Editors/Proofreaders perform hands-on proofing and editing of transcriptions completed by our team members. You will have the support of an on-site Board Certified Physician, a Supervisor of Transcriptions & Quality Assurance, plus innovative software and IT communications. Must be experienced in order to maintain our proven track record of exceptional quality and service. Excellent verbal and written communication skills are necessary. Certification desirable. We’re always on the lookout for freelancers who are sticklers for quality. We seek translators with excellent writing skills, editors with a flair for language, and with a meticulous eye for detail. Because of our business model, which provides clients with transcripts in the least possible time, we are looking for people who can both transcribe and proofread (not just proofread alone). If you can type at least 60 wpm and have an interest in learning how to transcribe audio, please feel free to consider working for Fantastic Transcripts. Pay is $10 to $12 an hour to start. Hours are flexible, dress is casual. Created by Caitlin Pyle, who makes a full time income proofreading on her iPad. FusionCash affiliates set their own hours – the amount of time you put it will reflect in your earnings. Also, the type of offers you fill out will vary your income as well. Having internet access and a computer is of course necessary. Depending on the difficulty of the data entry of the offer forms required, you will get paid anywhere from .50 cents to $25.00 per form. Payment to you is made by check or through PayPal. Internet access and a valid Email Address. You can refer others in order to earn more, but this is not required. Data Entry Operators on PCs entering names and address and other data for mailing lists. LOCAL RESIDENTS ONLY. Low turn over—so there is a waiting list of 6-9 months. Pays piece rate. Hiring CPAs to help with accounting work over flow. First, let’s make this clear… We do not charge fees. · In addition, many other areas of expertise are needed! A college degree is required and testing/training. Information specialists and expert Web researchers needed. Seeking information specialists (e-librarians, experts at information retrieval etc) for spare-time, telecommuting opportunities. All work conducted over the Internet, only work when you chose. Rates up to US$25/hour. Must live in a major city, have a home computer and be fluent in the English language. Please visit the website for more qualifications and details. Court Records Retrieval Experts Wanted! Background Profiles is currently looking for experienced county court record researchers for all counties. If you are a reliable source of fast and accurate county record information, please apply! Love the Internet? Are you always on it, like we are? Do you love kids? If so, you could get paid to surf the web! We are always looking for new faces to add to our surfing staff. You job would consist of searching, browsing, and exploring new ideas, and new ways to do anything related to kids on the internet. This is probably the most fun job you will ever have! We have no exact criteria, except that you are passionate about kids and the internet. Are you ready to become an online leader of a community of people who share your interests? Apply to become an About Guide! About Guides are fully empowered to do all of these things. Each Guide's mission is to create an easy, intuitive and gratifying experience for people interested in their topic. Hiring medical coders with experience. American Institute For Foreign Study (AIFS) has opportunities for Local Coordinators posted at their website. In communities across the United States, Local Coordinators assist AYA by finding qualified families to host visiting international students. Furthermore, the position offers good pay and you set your own hours. Our CR's contact local high schools to introduce our Program and present the students' applications. During the course of the Program, our CR acts as a liaison between the school, the student and the Foundation. Responsibilities include interviewing host families, planning orientations and providing support for program participants. – Hiring virtual assistants and support. Individuals with disabilities looking for telecommuting opportunities. We are continually searching for the highest quality people for positions throughout the company, if this seems like something you'd be interested in – reach out! Hiring agents and support reps to take inbound calls to verify information namely for utilities. Furthermore, the pay ranges from $8.50 to $9 an hour. In addition, bilingual agents will be paid on the higher end. Probably not a fast path to riches, but you can make extra cash online. If you're interested in make cash online, you'll probably like my post, Ways to Make Money ($600 a Year!) Online EASILY. In addition, feel free to check out the entire Make Extra Cash directory for awesome ideas. Easy quizzes and surveys for points. Every 100 points is worth $1. Yes – a buck per point. Super easy and people are raving about it! Though they can have start-up costs, many direct sales companies offer an affordable way to start your own business. There are many success stories of regular men and women signing up in direct sales and building a very lucrative business. If you're a candle lover – there are many companies out there to help you get started with your own business. Rather than just delete this page, I decided to keep it available to readers and visitors. Though it seems like it wouldn't be especially relevant considering it's age, I've found people love reading through it. While some jobs might not be available anymore, I do try to keep this post updated and remove anything that's no longer helpful. Furthermore, I've tried to go back through it and organize it and offer links to newer content. As a result, folks can find their way to topics that interest them most and are most current. Most of all, I like that a lot of readers find this page a good brainstorming post to help them figure out or discover new ideas for working at home that they hadn't yet. Yes! I agree :-) I even have a post on Amazon MTurk here, Amazon Mechanical Turk Review and Tips if folks want to check it out to learn more. Amazon MTurk is another good one, although I must admit the tasks they give you are extremely dull and/or repetitive. But it pays! Drat! Thanks for letting me know! I meant to say every 100 points was worth $1. Thank you again! MintVine pays $10 for 1000 points, not $1 per point. I am trying to find work from home because I am disabled and so is my husband. We are fighting for his disability so it is very hard to survive. So if anyone knows of anything I can start immediately the information would be greatly appreciated. I really need the extra money to help us stay in a home and be able to live until we can get his checks approved. Basically all of it. The mini jobs and the filling out forms and surveys. It all is basic data entry in a way. Question? When it comes to the data entry work for Fusion Cash, are you referring to the mini-jobs they have on their main page? T.I.A. Hello I am located in Romania. Does anyone know any work at home job that could work for me, please? I’ve seen that most of the jobs are for US residents. I worked for American companies in the past on a military base. Thank you. Great article and list. Can you please add us? We are hiring Mystery Callers from Elite Global Options and we pay $5/call. You can make $50/day making 10 calls, and that is only the first day. Our link to apply is above. Hi, I reside in Jamaica in the Caribbean. What data entry or typing works can I get online as a non-US resident? Season greetings! I am a mother of four and raising my grandson, he’s only two years old. I’d like to know if u also have any program making candles, or any craft items. I am so sorry to hear about your illness and stroke – and about your divorce as well. That’s a lot for any person to deal with in one lifetime. I hope your health is better now. Have you looked over the work at home company page here on the site? They don’t ask for credit cards and they are legit companies looking for people to hire. Several years ago I was very sick for about 2 years. I even had a stroke and was unable to return to work. At one time, I had owned and operated a Beauty Salon. If that wasn’t bad enough, my husband of 35 years decided he wanted a divorce. I’ve applied for disability and was quickly approved. I get a whopping amount of $710 a month and it takes all that to pay my bills, nothing left over and you pray nothing unexpected comes up. Though I have been looking all over the internet for a job, I do not understand why free doesn’t mean FREE. I’ll go check out something that I could do, fill out my information and then comes the page to enter your credit card information. If I had a credit card or extra money I would have to use it for my utilities. Can anyone point me in the direction where free work at home is FREE. Thank you for your assistance and I do enjoy your website. The best thing I can tell you is to just look around the site at the jobs offered, the companies that hire and the money making ideas. There are tons of work at home sites out there and I hope mine can help you in some way. I guess I just need a little guidance being new to all of this. My husband has recently gotten ill and our bills our piling up. I am looking for a data entry job so I can work from home to be here with him. If there is any direction you can point me in it would be greatly appreciated! I really don’t know. I’ve heard that a lot of these companies are bombarded with jobseekers wanting to work at home – so I think they just freeze hiring at times. I have sent my resume at least 3 times and left a message. Do they even have job openings because I haven’t received an answer? I have extensive data entry experience and currently work for a title company but would like a work from home job. I am a caregiver and I am looking for a job with flexible from the home. I’m able to provide my own computer and laptop. What a very thorough and wide-ranging list. This very helpful. When I found myself in a tight financial situation, these opportunities to work through the internet at home really saved me and my family. I am sure this list will prove to be really helpful to other people as well. You really can make a decent income going this route. I’ve come across this site and though I haven’t earned much yet, I’ve already discovered that the more smaller HITS I do the more that are available to me, with higher payouts. So I’m going to keep trudging through this one for a bit and see where it gets me. It’s free to sign up for and you can accept hits(which are just jobs) The jobs vary but are mostly simple enough. A job can be as simple as google searching a keyword to writing a 600 word article. The pay varies just like the job does. I’m up to 6.50 after about a half an hour of work. Might be worth checking out. Please send information on data entry jobs. There are so many opportunities to work at home these days. The internet has just exploded – and made telecommuting a possibility for so many. It’s just finding what works for you and the skills you have. Thanks for interesting and helpful information. Almost everyone have problems starting work from home job. It’s very difficulty to decide which thing is good which not.